This week I have been working with the Dorothy Springer Trust in Freetown Sierra Leone. 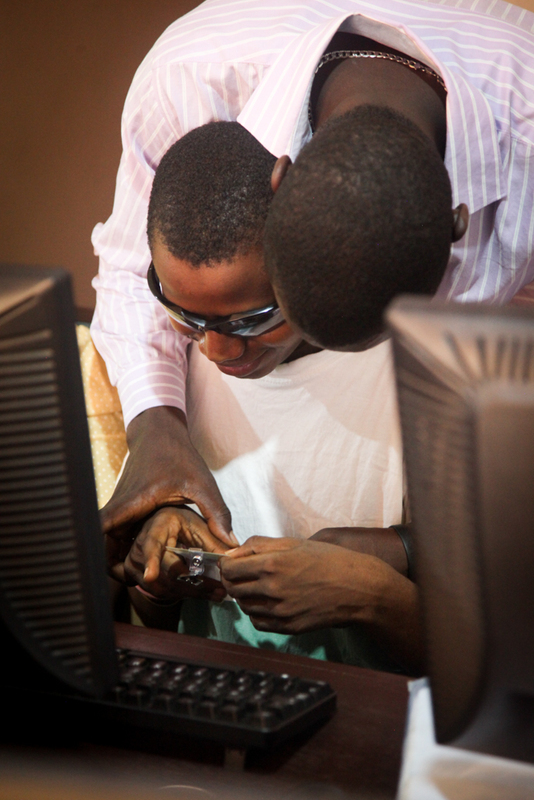 They work with people with disabilities to train them up in ICT and then help them find jobs in skilled positions. Here one of the participants on the course is assisted by a volunteer. Teaching is led in a creative and descriptive manner so course members with visual impairment can access as much information as possible. Here the student feels an ID card as the trainer describes it to him. This session is part of the Basic Skills in ICT course and students were looking at what security measures can be put in place on a computer. Using the ID card was a great introduction to some of the ways we restrict information or access in the offline world. This is really a nice initiative. We appreciate it. Thanks for the comment – the charity is doing great work and proud to be supporting it! What a gorgeous comment! Thanks so much Mariama.